When the Veterans Administration in Phoenix began to fall significantly behind on a policy stating that veterans should get the care they need within 30 days, workers devised a solution that involved entering information into a computer screen, printing the screen, and then not saving the record. This allowed them to hide the long wait times some veterans endured, sometimes longer than a year, from oversight. The nation’s veterans were denied healthcare they were promised, and the organization responsible for providing that care was hiding its failures with a scheme that apparently involved Arizona VA employees from front-line administrators all the way up to the top management. It turns out VA offices around the country were using similar tricks. The speed and success of the VA and the Obama administration’s response to the scandal will inevitably be measured against the speed and success with which it fixed Healthcare.gov: We’ve seen the administration fix a gigantic catastrophe; now point that response over there at that. This is an unfair standard. Healthcare.gov was a major technological failure, but it wasn’t nearly as large or as entrenched as the bureaucracy of the Department of Veterans Affairs. The VA has a staff of more than 300,000 spread over thousands of facilities. And while the root problem is with the scheduling system they use and the overall shortage of resources and explosion of veterans requiring services, the immediate problem here is staffers in the Phoenix office submitting deliberately incorrect information to hide the amount of time veterans were waiting. This type of deception has to involve both regular employees and supervisors: a true conspiracy. Improvements in oversight and auditing are surely part of the solution here, but there’s a much more fundamental change that needs to happen: Regular line-level employees who see wrongdoing on the part of their coworkers, or are asked to engage in wrongdoing by their supervisors, need to be able to do something about it without threat of retaliation. Any human endeavor examined closely enough is a disgraceful mess, and most of us know this most directly from our jobs. But we also instantly recognize true malfeasance when we directly encounter it. So, of all the people who were involved or knew about these terrible practices who worked at the VA, why did it take so long for the truth to come out? A recent CNN report quotes Dr. Sam Foote, a doctor who had worked for the VA for 24 years. “I feel very sorry for the people who work at the Phoenix VA,” said Foote. “They’re all frustrated. They’re all upset. They all wish they could leave ‘cause they know what they’re doing is wrong. It’s telling that Foote went to the press only after retiring. Despite the Whistleblower Protection Act of 1989, the federal government during the Bush and Obama administrations has grown increasingly hostile to whistleblowers. Barack Obama campaigned on transparency and whistleblower protection; his transition agenda said, “Often the best source of information about waste, fraud, and abuse in government is an existing government employee committed to public integrity and willing to speak out. Such acts of courage and patriotism, which can sometimes save lives and often save taxpayer dollars, should be encouraged rather than stifled.” Since taking office, however, he has prosecuted twice as many people under the 1917 Espionage Act as all the previous administrations combined. These are the most extreme cases, but they represent a culture and ethos that appears to permeate the federal government. In this environment, it’s not surprising that federal employees are reluctant to come forward with complaints. 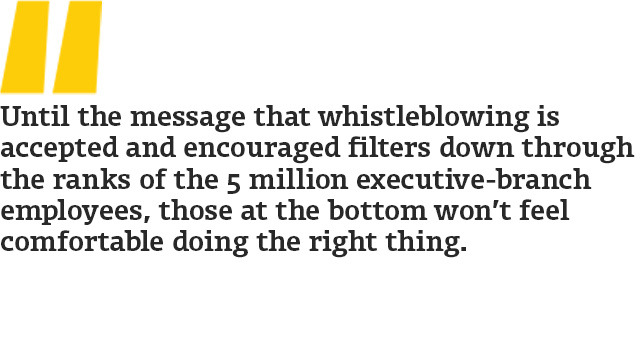 Until the message that whistleblowing is accepted and encouraged filters down through the ranks of the 5 million executive-branch employees, those at the bottom won’t feel comfortable doing the right thing. Perhaps we’ll hear the stories of what ends up happening to those who have come forward from VA offices around the country since the Phoenix revelations to cast light on problems in their own departments, and perhaps that will help bring about the change we need. From the prosecution of Chelsea Manning and Edward Snowden to the woefully inadequate implementation of the Whistleblower Protection Enhancement Act, the Obama administration has helped to maintain an environment of fear among federal-government employees. Internal and external reports of wrongdoing by those on the ground are an essential part of keeping any organization running reasonably well, and they’re being actively prevented. Until that system is addressed, we won’t know what other horrific problems exist in the government’s vast bureaucracy. We won’t even know whether the VA scheduling abuses have been corrected. Unlike Healthcare.gov, there’s not a publicly visible website that anyone can try out. Whistleblowers are the only avenue for accountability.